Usually ships in 4-6 business days, FREE Shipping available. 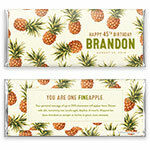 Vintage illustrated pineapples create a crazy tropical pattern on this fun birthday chocolate bar wrapper. This is the “wrapper only” version of this design, ready to assemble with your own candy. Easy instructions are included with every order and a selection of foil colors are available for you to choose from. 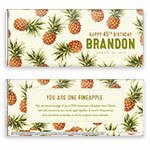 Design: Pattern of illustrated pineapples on a plain background. Personalization: Front message and name with a back message.